Rainbow Grocery | 1745 Folsom Street, San Francisco, CA. 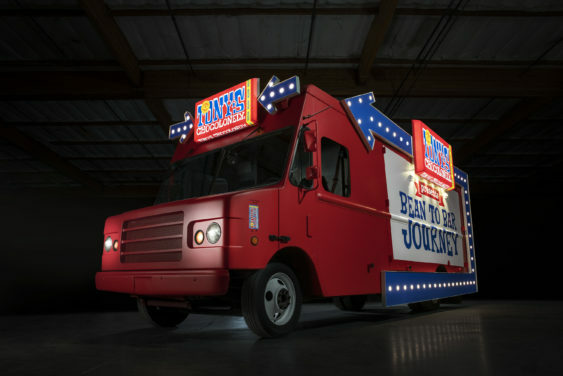 Tony’s Chocolonely, the Amsterdam-based chocolate company, is hitting the road for Tony’s first-ever Chocotruck Tour across the US. On April 19th and the 20th, they will be in San Francisco to share their chocolate and mission for 100% slave free chocolate worldwide. The Chocotruck is equipped with interactive displays and will offer an unparalleled experience for visitors to learn about modern slavery and illegal child labor in the chocolate industry. They will also be giving chocofans a taste of all the delicious flavors currently available in stores. In addition to learning about the cocoa industry via hands-on features throughout the truck, visitors will have the chance to enjoy tons of chocolate and have a blast with Tony’s team – including the trucks captain and co-pilots. The truck already spurred viral-level interest on its nationwide search for the caption and co-pilots and now the San Francisco community will have a chance to see it for themselves. Address: 1745 Folsom Street, San Francisco, CA.